This artwork has been acquired by the Huai'an Art Museum of China for their permanent collection in January 2019. The work is a complex lithograph, part of two prints which were exhibited as part of the International Academic Printmaking Alliance 2nd Invitational Exhibition, originally on show in Jingdezhen, China in September/October 2018. This exhibition has since toured to Huai'an City, China. 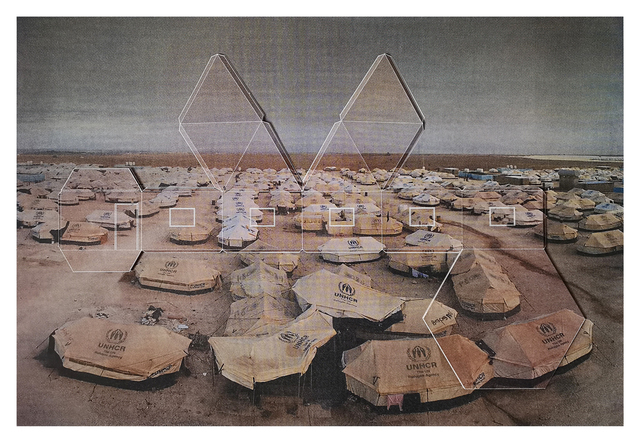 The work is part of a series of lithographs based upon UNHCR (United Nations refugee Agency) emergency shelter programmes and their impact in disaster or emergency refugee zones, Azraq Camp in Jordan, Za'atari camp in Jordan and Kutapulong in Bangladesh. The works explore the living conditions in each of these camps, focussing on various types of emergency shelters which exist in varying parts of the world, most of them not available in the camps depicted.